Milk delivery service Milk & More has become the first UK company to deploy electric vans from StreetScooter. 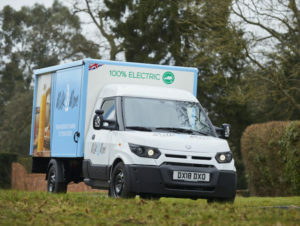 The fleet of 200 vehicles – worth £6.5m – are being rolled out across the company’s UK operation as it looks to transform its fleet in line with its environmental promise. Previously only used in Germany by Deutsche Post – which acquired StreetScooter in 2014, the vans are powered by rechargeable batteries and are being used by Milk & More to replace diesel vehicles – the switch to the vans means that a third of its fleet will now be electric. They’re also helping to cut fuel, with Milk & More having seen a 90% reduction in operational fuel costs in the first month compared to the outgoing diesels. The StreetScooters have a 905kg payload and an 8m3 box, enabling Milk & More to carry 860 pints of milk at a time, as well as a range of locally sourced products. The zero-emission vehicles also have a range of up to 75 miles and bring noise reduction benefits. Patrick Müller, CEO of Milk & More, said: “The new StreetScooters are our most environmentally friendly milk floats yet and are a fundamental part of a wider business strategy to provide a trusted home delivery service that connects customers with a wide range of high quality, locally sourced products.